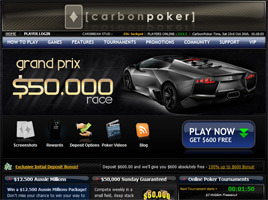 The ongoing New Member Welcome Promotion at Carbon Poker is a 100% Deposit Bonus up to $600. To qualify, anyone newly signed up on the web site must make a first deposit using the special Initial Deposit Bonus code UPTO600. The bonus cash is released in increments of $5 for every 375 VIP points earned. A maximum of 120 awards are given until the entire $600 bonus has been paid out. Operated as part of the Merge Gaming Network, Carbon Poker offers a downloadable poker room using software licensed in Curacao, Netherlands Antilles. The poker web site has been in operation since 2005 and its online digital gaming platform was most recently updated to version 4.7 in December 2009. All of the games on Carbon Poker are denominated in U.S. dollars, with English used as the primary language. At any given time, more than 4,000 players can be found at its virtual tables. Once the free poker client has been downloaded, all of Carbon Poker’s game features are accessible, from scheduled tournaments with guaranteed cash prizes to SitnGos, Satellites, and Daily Freerolls. Limit, Pot Limit, and No Limit ring games are always open, 24 hours a day, seven days a week. There are plenty of big prizes to be won, too. Every Sunday, for example, there is a $50,000 Guaranteed tournament. Other events award travel and seats at live competitions, including the World Series of Poker. Although Texas Hold’em and Omaha are far and away the most popular versions of poker played at Carbon Poker, the web site also offers a broad range of alternatives—more than a dozen games in all. These include H.O.R.S.E., Razz, Stud games like Deuce to 7 Lowball, closed games such as 5-Card Draw, and even the four-card triple-draw game known as Badugi along with other specialized poker variations. In fact, Carbon Poker has pioneered the way for Caribbean Stud on the Internet. In September of 2007, it awarded $20,318.75 for a 20-cent jackpot bet, setting the stage for even bigger winners to come. Most recently the progressive prize pool topped $68,000 and six-figure jackpots are no longer uncommon. Another non-standard card game available at Carbon Poker is Euchre. It is just one of many “side games” offered, from Blackjack and Roulette to Video Poker and Backgammon. And interaction with other members of the online poker community is enabled through a moderated poker forum, the Carbon Poker blog, and the site’s own Poker School, which provides the latest in poker strategy, tips, and how to play in events online. New players receive 14 days worth of entries into the Daily $500 New Depositor Freeroll. That means it costs absolutely nothing to get started playing for the first two weeks. Thereafter, a variety of limited time reloads, deposit bonus offers and exclusive promotions kick in, making deposited dollar stretch even further. Among the web site’s many featured promotions are the Royal Flush Bonus worth 100X the big blind, the SnG Leaderboard awarding points and over $10,000 in cash prizes monthly, and the progressive Bad Beat Bonus, which during the year just past hit for whopping $257,089.81. Other promotions have included a Haiti Charity Tournament, bonuses tied to the United States Major League Baseball World Series, and America’s National Football League. Anyone referring a friend to Carbon Poker is eligible for an instant $25 plus free entry to a $50 Heads Up Sit’n’Go match played against the referred friend. The web site also has a VIP Club with tiers of membership ranging from Earth, Wind, and Fire to Water and Ether. Benefits include cash bonuses, invitations to special VIP tournaments, extra freerolls, and shopping opportunities in the VIP Store.